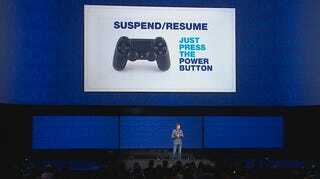 Sony released a new firmware patch for the PS4 today, and with it, the suspend/resume feature promised way back in February of 2013 is finally here. To use the feature once you've downloaded the 2.50 patch, first go into Settings -> Power Save Settings -> Set Functions Available In Rest Mode, then make sure you have "Keep Application Suspended" checked on. Then all you have to do is put your PS4 into rest mode while playing a game. When you turn the system back on, it'll pick up where you left off. We've tested out a few games and the suspension feature seems to work well, although you can't use it while playing online, for obvious reasons. Have you run into any problems? Let us know.